Nutritionist and Foodtrainers.com founder shares some simple food swaps that should be part of every pantry. 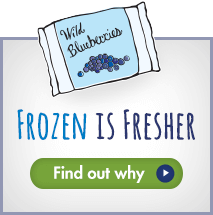 She recommends Wild Blueberries because they’re loaded with resveratrol and anthocyanins and easily found in the frozen food aisle of grocery stores. Nutrition expert Amy Gorin, MS, RDN, recommends using frozen Wild Blueberries to naturally sweeten up your favorite breakfast smoothies or pancakes. Amy Gorin, MS, RDN, recommends adding Wild Blueberries to your diet because they are high in fiber, rich in antioxidants, and they can help you lower your cholesterol. This delicious Wild Blueberry Noodle Kugel from registered dietitian Lauren Harris-Pincus swaps out traditional apple and cinnamon for a Wild Blueberry and lemon flavor and has 50% less sugar. This is no ordinary Bundt cake. Registered dietitian Liz Shaw creates an easy-to-make Bundt cake using a ready-made boxed muffin mix amped up with a cup of delicious Wild Blueberries. As we age, we change our style, skincare, and exercise routines. But what about our diet? This article examines easy changes you can make to your eating habits, including adding antioxidant- rich Wild Blueberries to prevent premature skin aging and reduce inflammation that can cause serious diseases later in life. Registered dietitian Lauren Harris-Pincus shares her experience on the Maine Wild Blueberry barrens and why she has fallen in love with this special fruit.